I hadn’t appreciated what it meant to Monet to work in a series. I knew the haystacks and the cathedrals and the water lilies showed different times of day – that you could see the morning in the yellow light along one edge of a bridge or doorframe and the evening in the lavender along the other – but I hadn’t really thought through how Monet would then actually have to work on them. I assumed, I think, that he began, say on a morning painting of haystacks, finished that one and then moved on to one of the afternoon. But he was painting actual haystacks and of course the effects he was interested in were only visible for perhaps an hour, or much less on any given day. He had to work on the whole series at once, and he switched from canvas to canvas as the light changed. This is an extraordinary feat of concentration, like playing simultaneous chess games. Although the paintings in a series all had cathedrals in them each one was different in cast, in the range of color and emotion. Imagine working simultaneously on ten essays and switching every hour. Watching Monet, surrounded by his canvases, made a vivid impression, and he and his friends left wonderful glimpses of what he was like at work. There were some further ways in which Monet conceived of ‘working in a series.’ Although he was wary of talking about studio work, far from the plein air that was the Impressionists’ rallying cry, still the series were finished in the studio. To feel balanced and deep, a picture needed the period of further consideration possible in the studio. There, too, he worked on what might be called their “seriesness,” laboring to distinguish each from the others and to assemble a set of impressions and effects of light that made sense as a group. This meant that none of them were finished until all of them were finished. The group often referred to as the fundamental series is those of the haystacks, perhaps because the method was there worked out completely, or because Monet intended to show them as a group, and did, with Durand-Ruel, in 1891. He had apparently thought he would have just two canvases – one was to show sunlight and the other gray weather. But, as he worked, the effects he wanted to catch, those that demonstrated what he called “instantaneity,” multiplied, and in the end he showed fifteen pictures. These were a financial success, the dealer was able to sell them for between 3,000 and 4,000 francs. From time to time, he stopped. 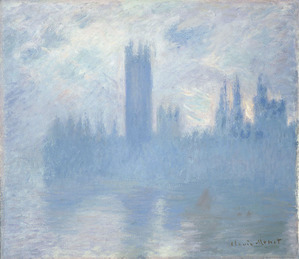 “The sun isn’t there any longer,” he would say….All of a sudden Claude Monet would seize his palette and brushes. “The sun has come back,” he said. He was at that moment the only one to know it. The others on the balcony looked intently for the change Monet had seen, but could not find it. (1) Guy de Maupassant, La vie d’un paysagiste, Le Gil Blas, Sept 28, 1886, quoted in Rewald, p517. (3) Quotes from René Gimpel are from Diary of a Picture Dealer, p73 and p129, quoted in Monet in London, exhibition at the High Museum of Art, text by Grace Seiberling, p55. Letter to Alice of 1901 is w. 1593, quoted in Seiberling, p58. (4) E. Bullet, “MacMonnies, the sculptor, working hard as a painter,” The Eagle (Brooklyn) 8 September 1901, quoted in Seiberling, p62. (5) Charteris, John Singer Sargent, p126, and Duc de Trévise, “Le Pélerinage de Giverny,” Revue de l’art ancient et modern 51 (1927), quoted in Seiberling, pp68-69. (6) 24 March, 1900, w. 1537, quoted in Seiberling, p59. (7) Interview with Marcel Pays, Excelsior, 26 January 1921, quoted Seiberling, p70. (8) Geffroy, Claude Monet: sa vie, son temps, son oeuvre, 1922, quoted Seiberling, p64-65.